Google working with Samsung on a 10in Nexus tablet? | What Hi-Fi? Google working with Samsung on a 10in Nexus tablet? Google and Samsung could be set to launch a 10-inch tablet device under the Nexus brand according to analyst reports. 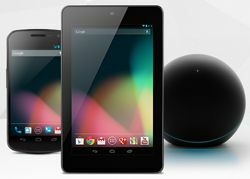 The Google Nexus 7 tablet made a lot of noise for its size and price – but this tablet was built in conjunction with Asus. Samsung meanwhile has struggled to make a dent in the tablet market with its range of Galaxy Tab tablets at various sizes and now the company's new Galaxy Note 10.1 tablet. A collaboration between Google and Samsung would most likely be on a premium tablet and of a larger - most likely 10in – screen size than the Nexus 7. Richard Shim, an analyst at NPD DisplaySearch who correctly predicted the Kindle Fire tablets, says "supply chain indications" point towards a 10.1in tablet with a 2560 x 1600 resolution display, reports cnet. This would give it a considerable PPI – pixel per inch – advantage over the new iPad, which has a 2048 x 1536 9.7 in display. Though of course, there's more to a great screen than simply packing in pixels. At the other end of the price spectrum, Shim also suggested that Google was working on a $99 tablet in time for Christmas, most likely at a much smaller screen size and with fewer features than the Nexus 7. With Apple set to announced the iPad mini at the end of this month, which could go on sale as soon as November 2nd, it looks set to be an interesting couple of months in the portable market.